A great new feature has been added in Surfer 12! There is now the ability to grid or display logarithmic data. This feature can be used to display your data in a way that accurately conveys the logarithmic information in an easy to interpret display. First, it would be useful to ask a few simple questions about why you would want to use this feature. Why would I grid my data as log save as linear over log save as log? This option is a good choice if your data spans several orders of magnitude and you want the resulting Z value in the grid file to be in the same units as your original data. However, the areas with the very low data values and the areas with the very high data values are smoothed over. Why should I set the Level method for a contour map using my log save as log file to Logarithmic? When you choose the Log, save as log option, log-distributed data is displayed much more accurately than the linear contour map, as it more closely honors the very low and very high data points. Why should I set the colormap for that same contour map to Logarithmically-scaled? It is important that the colormap and the contour map display using the same scaling. If the contours are displayed with a linear colormap, a logarithmic color scale bar would have a meaningless correlation to the map. A. Gridding data as linear, displaying with a linear levels and colormap. B. Gridding data as logarithmic, displaying with linear levels and colormap. C. Gridding data as logarithmic, displaying with logarithmic levels and colormap. You can see from the color scale in example C that the concentration (ppm) values range over 5 orders of magnitude, from 0.001 to 4000. Displaying a contour map of this data using a linear scale generates lines of equal concentration that lose much of the variability in the data. Displaying the contours using a logarithmic scale provides a much better indication of the distribution of the concentration throughout the map. To put a real-world spin on this topic, consider that the above maps represent the plume of a 1DNAPL contaminant, such as 2PCE. For this type of contaminant, even low-level contamination can present a significant human health risk when dissolved in groundwater. Using the grid from Example A, you might be tempted to underestimate the risk associated with the contamination which has migrated away from the source zone. Examples B and C better illustrate the extent and direction of contamination. 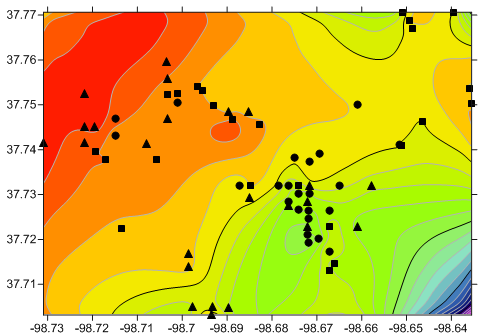 They show isolated regions of high contamination concentration that do not stand out significantly in Example A. The logarithmically contoured grids show a higher degree of plume delineation than the linear grid does. 1DNAPL: Dense Non-Aqueous Phase Liquid. To create these maps for yourself, follow the example I have provided to make use of the new functionality in Surfer 12. Use the File | Open command to open the data file VOC_Concentrations.xlsx. Use the Grid | Data command to begin the process of gridding your XYC data. In the Open | Data dialog, select the data file: VOC_Concentration.xlsx and click Open. Set the X, Y, and Z Data Columns to Column A: X, Column B: Y, and Column C: ppm from your dataset. Select the Gridding Method that you would like to use. I have left this to the default method, Kriging. Linear – uses the Z values in the worksheet for gridding. No transformation is applied to the Z values. The Linear method is a good option for data that gradually increases over space. Log, save as linear –takes the log (base 10) of the Z values and uses the log value for gridding. The grid is then converted back to the linear Z values by taking the antilog of the gridded results. Specify the Z Transform to create linear or log grid files of our data. Uncheck the box next to Blank grid outside convex hull of data so the contours will extend all the way from the minimum data limits to the maximum data limits, filling the entire rectangular map frame. Click OK to generate your grid file. a. To create a contour map, click Map | New | Contour Map. To create a 3D Surface, Click Map | New | 3D Surface. b. In the Open Grid dialog, select the grid file you just created and click Open. If you have created a contour map using logarithmic distributed data, then the color scale will automatically adjust to a logarithmic color interval. 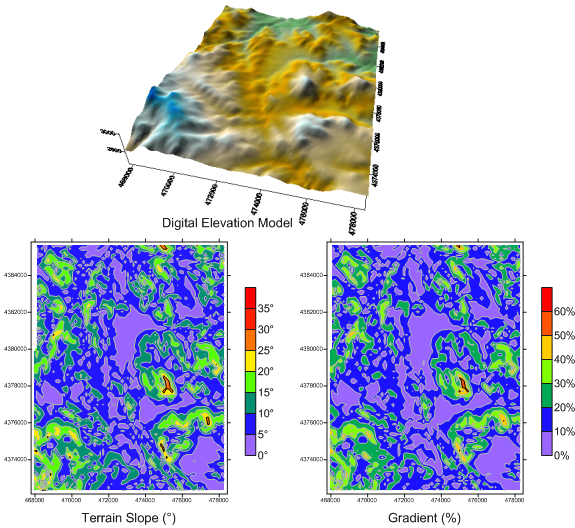 In the example below, the image on the right is displayed with a logarithmic colormap, while the image on the left is display with a linear colormap. 1. In the Object Manager, select a Contours layer. 2. In the Levels tab of the Property Manager, expand the + next to General. 3. Next to Level method, select Simple, Logarithmic, or Advanced. You can also specify the Minimum contour and Maximum contour for your Logarithmic color scale (outlined in green below). Specify the Level method for your Contour layer and set custom Minimum and Maximum contour levels to display on your contour map and in the color scale. Your Contour map has now been created using Logarithmic scaling for both the contour interval and the color scale.